A 100% Free Website Blocker for the Microsoft Windows Operating System. Is your child abusing his or her Internet privileges by watching obscene videos? Are your employees spending too much time on recreational sites? If so The Web Blocker is for you.Here’s what else The Web Blocker will do for you. Block any website on the internet on a per-user basis. Monitor internet history on a per-user basis. The Web Blocker is now a 100% Free Website Monitoring Tool! It is an easy-to-use, powerful free Internet Filter brought to you by Webstart Studios, LLC. Download your free website monitoring tool. 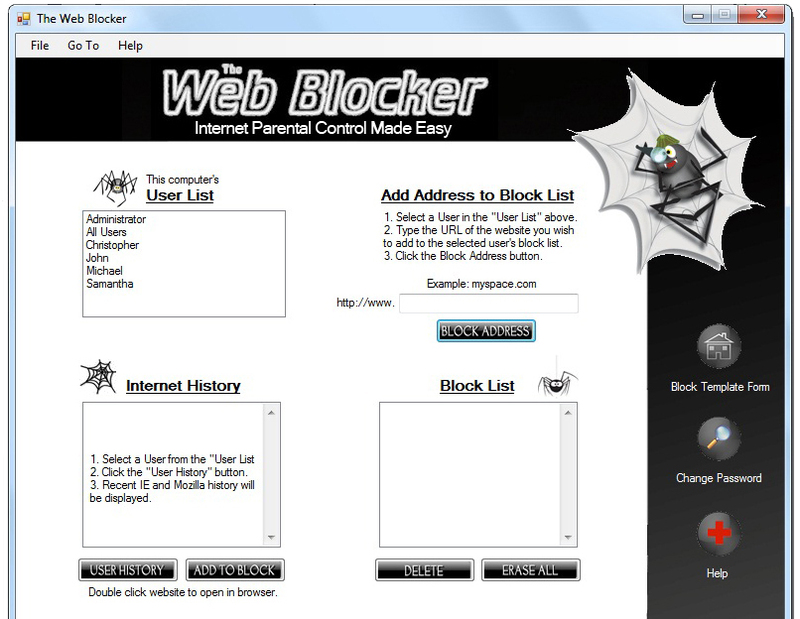 The Web Blocker can block any site on the Internet with one click of the mouse button. The internet parental control software can block Facebook, MySpace and any other site on the net. It’s one of the only free internet parental control programs on the web! !